(Phys.org) —A team of researchers made up of members with diverse, multi-national backgrounds has found a way to construct population density maps using cellphone data. In their paper published in Proceedings of the National Academy of Sciences, the team describes how they obtained the cellphone data, how accurate their maps were and possible uses for such maps in the future. Officials in different countries use a variety of techniques to gather census data, from going door-to-door, to using satellite imagery to analyzing tax documents. Now it appears that data from cellphones can be added to the list. The researchers note that knowing where people are at any given time is important for governing officials as it can be critical in times of emergencies, such as during natural disasters. Most techniques rely on satellite imaging which isn't very timely. They decided to find out if it might be possible to gather more up-to-the minute information using cellphone data—currently, it is believed that approximately 90 percent of people in developed countries have a mobile device, thus if all those users could be mapped somehow, it would provide snapshots of population densities. To make that happen, the researchers turned to carriers in Portugal and France—covering 2 million people in the former and 17 million in the latter. The data was filtered of course, to prevent private individual user data from being revealed. The data that was tracked was cellphone use via towers, not GPS positioning. Using just call records the researchers were able to build population density maps for the areas covered in the study, over different dates. This allowed for watching as the population moved around, traveling back and forth to work during the week, and out to the countryside on the weekends. 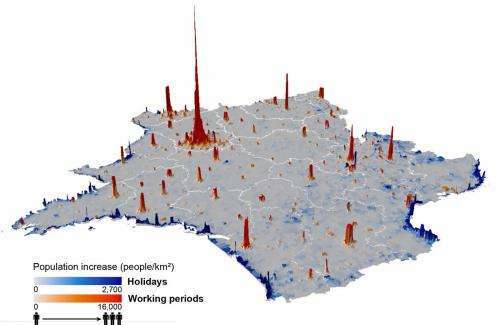 They were also able to build maps that showed the mass migration that occurs in parts of France during holidays with populations dwindling in major cities such as Paris, while those in small resort towns along the coast grew substantially. The researchers acknowledge that their maps aren't accurate enough for use in conducting official business, but suggest they are more than accurate enough for use in times of need—such technology could prove useful, for example, in places like West Africa where the Ebola virus is causing large movements of people in unpredictable ways. During the past few decades, technologies such as remote sensing, geographical information systems, and global positioning systems have transformed the way the distribution of human population is studied and modeled in space and time. However, the mapping of populations remains constrained by the logistics of censuses and surveys. Consequently, spatially detailed changes across scales of days, weeks, or months, or even year to year, are difficult to assess and limit the application of human population maps in situations in which timely information is required, such as disasters, conflicts, or epidemics. 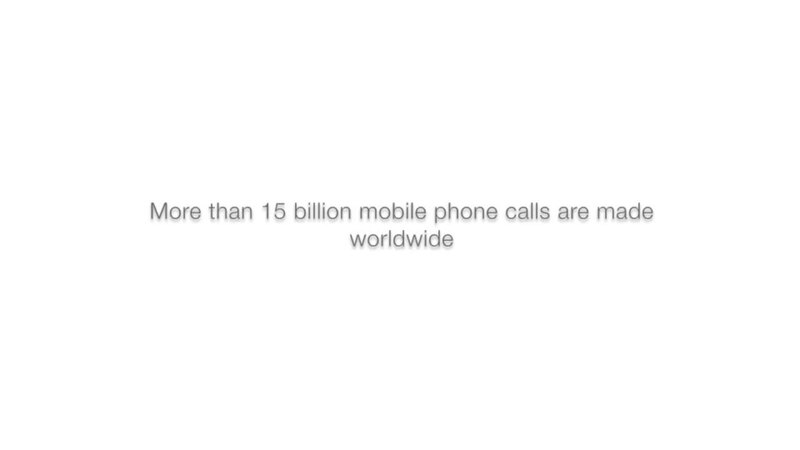 Mobile phones (MPs) now have an extremely high penetration rate across the globe, and analyzing the spatiotemporal distribution of MP calls geolocated to the tower level may overcome many limitations of census-based approaches, provided that the use of MP data is properly assessed and calibrated. 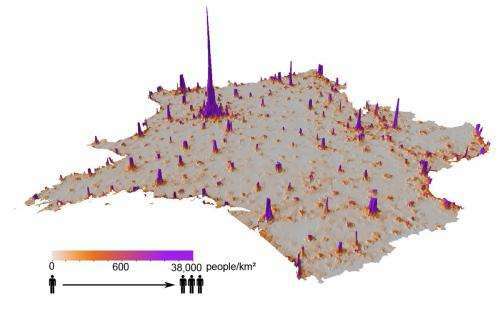 Using datasets of more than 1 billion MP call records from Portugal and France, we show how spatially and temporarily explicit estimations of population densities can be produced at national scales, and how these estimates compare with outputs produced using alternative human population mapping methods. We also demonstrate how maps of human population changes can be produced over multiple timescales while preserving the anonymity of MP users. With similar data being collected every day by MP network providers across the world, the prospect of being able to map contemporary and changing human population distributions over relatively short intervals exists, paving the way for new applications and a near real-time understanding of patterns and processes in human geography. France has a lot of open and empty space, it's kinda nice actually.